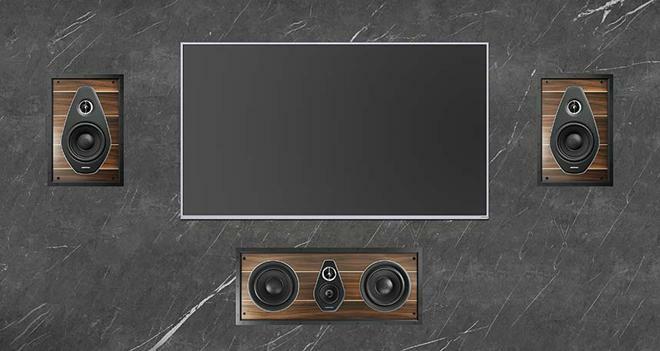 To coincide with this week's 2019 ISE Show in Amsterdam, Sonus faber has announced a new lineup of custom installation in-wall and in-ceiling speakers geared toward bringing premium craftsmanship and performance to the architectural audio market. The upcoming Palladio Collection will be broken into Level 5 and Level 6 lines, offering a total of 13 models. The Palladio Level 5 series consists of 2 In-Wall and 4 In-Ceiling speakers designed to complement the company's existing Sonetto speakers. Meanwhile, the Level 6 series includes 2 In-Wall and 5 In-Ceiling speakers designed to pair with Sonus faber's Olympica speakers. In addition, users can also add an optional passive in-wall subwoofer (PS-G101) to the package. Under the hood, the lineup features Silk dome tweeters with DAD (Damped Apex Dome) technology, along with mid-ranges and woofers equipped with natural fiber and cellulose pulp diaphragms. Likewise, Paracross Topology circuitry has been implemented into the Crossover network for improved clarity and sound purity. The Sonus faber Palladio Collection is set to launch in Q3 2019. Details on pricing will be announced Q2 2019.